There’s nothing more enjoyable than a brisk walk in the country (okay there might be a few things). It’s a great way to spend a Sunday morning – but don’t underestimate the dangers of a stroll! Whether you’re strolling on the outskirts of town or hiking in the highlands, it’s important to be aware of basic walking safety. If you’re walking in remote countryside, it’s easy to get lost and walk for miles without encountering a person. For this reason, check out your route before you leave. (There are lots of downloadable OS maps for walkers online.) Don’t tackle a 6-mile hike if the only walking you usually do is between car and office. Make your route manageable, and it’s also a good idea to check out shortcuts (just in case). If you want to take a longer walk than usual, plot a pit stop at a pub or cafe for rest and refreshment. The main dangers to walkers are weather and terrain-related. You can avoid both by being adequately prepared. Even if you don’t burn easily, pack hats and sun cream in summer (don’t forget you could be out for longer than you plan! ), and – correspondingly – appropriate winter-proof gear later in the year. Pack insect deterrent if bugs are likely to bother you. It’s easy to underestimate water supplies while walking: even in winter, you’ll need to keep drinking, and not just when you get thirsty. If you’re off on a solitary stroll in the country or town, pack a charged mobile, and tell someone where you’re going – and when you’ll be back. It takes little to keep people informed, and could save you if you get totally lost! A whistle is often recommended to hikers – even if your phone’s battery dies, a whistle can be relied on to reach passers-by for miles. It will also frighten off animals if you’re nervous! If you’ll be a while, or if you are responsible for children in the walking party, it is advisable to pack some essential first aid supplies. This could include plasters (for minor cuts and blisters), sterile dressings (to staunch heavy blood flow), triangular bandages (to support weak bones), safety pins, bite cream, and antiseptic wipes. If you’re heading out for a country walk, follow the walker’s code. Stick to footpaths, close gates behind you, and don’t pick from the hedgerows (the odd box of berries is okay, as long as you know what you’re picking). Keep dogs on leads near livestock, taking particular care in calving season, when cows can become aggressive. If you encounter a bull, back away slowly (it is illegal to keep a bull in a field crossed by a footpath, so report it when you get back). If you’re planning a walk in a really remote area, national park, or mountains, you will need to take additional precautions. Some parts of the UK can become treacherous for walkers: the Scottish Highlands is known for the quick arrival of cold and icy wind. You may want to pack extra walking equipment, like sun cream, metal spikes for your shoes (to handle ice), warm clothes and gloves, and a kisu shelter (like a tent to provide emergency shelter). 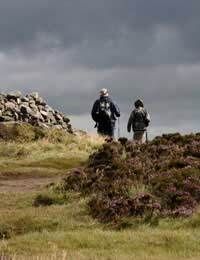 You can find out more about safe walking by contacting your local Ramblers' Association.